I read this article and found it very interesting, thought it might be something for you. The article is called Traditional Economics Can’t Help. 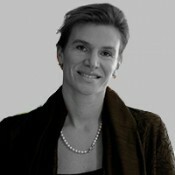 We Need to Rethink Growth and Capitalism and is located at http://evonomics.com/modern-economics-rethink-growth-capitalism-mazzucato/. Her question went to the heart of two huge failures of modern economics: the near collapse of some of the world’s major economies; and the faith in an orthodox economic framework that offered no explanation for what was happening. 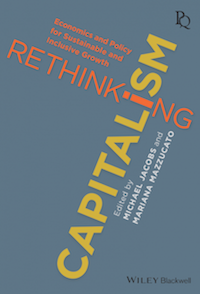 The thesis of my new book Rethinking Capitalism: Economics and Policy for Inclusive and Sustainable Growth, co-edited with Michael Jacobs, is that these two failures are intimately related. The failure by policy-makers to fully understand the dynamics of the capitalist system not only leads to periodic crises; it also leads to the wrong remedies, such as the pro-cyclical austerity that has only deepened and prolonged the crisis in many countries. Eight years on from the global financial crisis, the IMF is still describing the global recovery as “weak and precarious”. It points to modest recoveries experienced in most advanced economies characterised by “weak productivity, low investment, and low inflation”, which in turn reflect “subdued demand, diminished growth expectations, and declining output growth” (IMF, WEO, Oct 2016). Indeed, in most advanced economies investment remains below pre-financial crisis levels. If future growth is to take a different path, it will require more than the usual mantra about taking advantage of low interest rates to fund infrastructure. Instead, we need to rethink the fundamental precepts that govern our understanding of how and why capitalist economies grow—both in terms of the ‘rate’ and the ‘direction’ of change. 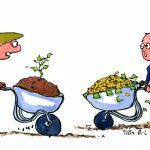 Key to this is a better understanding of what drives business investment, and the effect that public investment can have—not just ‘crowding-in’ investments that businesses may already have been considering, but actively stimulating the desire to make new investments they hadn’t yet considered. It is this ability of bold, strategic public investments to rouse what Keynes called the ‘animal spirits’ of business investors that is key. Looking at the economy through an investment lens is indeed instructive. Weakness in investment in part explains the persistence of output gaps across advanced economies, but also the slowing in growth of the volume of international trade. But the key question is, what kind of investment is needed? Would simply digging ditches and constructing bridges and roads suffice? There are two key issues here. The first is that it has historically been ‘mission-oriented’ public investments that have increased business-investor expectations about future areas of growth. Indeed, in biotech, nanotech and IT, bold strategic public investments created new landscapes that then crowded in business. The second is that the grand societal challenges of the future—from climate change to the demographic crisis affecting much of the West—requires visionary thinking about future growth possibilities and a broad array of public investments to make those opportunities emerge. ‘Market failure’ theory is not adequate to understand this approach. Those who advocate the inevitability of secular stagnation miss both these points. Stagnation is not caused by the deterministic forces of an ageing population, high savings, and exhausted tech opportunities. Rather, it is a result of falling private and public investment that has prevented the emergence of new investment opportunities. In other words, it is the result of choices made by public and private actors: opportunities are endogenous to investment, and when there is a crisis on both the public and private sides, stagnation sets in. On both sides of the Atlantic, public companies are sitting on record piles of cash—around $2 trillion in the U.S. and a similar amount in Europe—which they are choosing to hold rather than to invest. At the same time, over the last decade, more than $3 trillion has been returned to shareholders in the form of buy-backs, in some cases, like Pfizer and Exxon, exceeding their net earnings over the period. This reflects the extent to which the so-called ‘real’ economy has become financialized in the name of shareholder value, where it has been easier to boost share prices (and with it executive remuneration) through buy-backs, than through investment in the company’s future. This failure of corporate leadership has been matched by an equal failure of public policy. After the crisis, public debate focused narrowly on the size of public deficits, rather than on how to raise long-term growth. But the size of the deficit, year to year, matters far less than the question of what it is spent on, and how that spending affects the debt-to-GDP ratio in the medium to long term. Many of the countries across Europe that have the highest debt-GDP ratios are also those that have had moderate deficits. Their problem was not the size of their deficits, but the slow rate of their GPD growth. Italy’s deficit, for example, has been lower than Germany’s for a decade. The problem for Italy, as elsewhere, was the lack of investments in areas like human capital and R&D that increase long run growth. In mainstream theory, Keynes’ ‘animal spirits’ are assumed: firms are naturally inclined to invest, but will do so if only they receive the right incentive signals in the form of barriers being removed and competitive prices. In reality, however, business tends to invest only when it sees a growth opportunity. Cutting the cost of investment – through tax reliefs or other indirect mechanisms – will not be effective in stimulating investment if businesses do not see opportunities for growth. Historically, generating such opportunities has been closely tied to mission-oriented public investments that have created and shaped new markets through direct strategic investments: market making, not market fixing. In Silicon Valley, for example, the public investments have not been limited to solving ‘public good’ problems such as the positive spill-overs from basic research. The breadth and depth of public investments were present across the whole innovation chain: basic research, applied research, and even early stage high risk funding for companies (through organisations like SBIR) providing the patient strategic finance not forthcoming from the private market. Despite all the talk about reforming finance after the crisis, too little attention has been given to the quality of finance. The long-term nature of innovation, and the extreme uncertainty which underlies it, means that it requires strategic, long-term, patient finance rather than venture capital seeking a quick return and exit. But today’s emphasis on cutting government budgets, and/or the need to show quick returns from such investments puts the public side at risk. The investment lens is also missing from the debate about the effect on jobs of new technologies, especially Artificial Intelligence. Economists tend to discuss the ‘skill bias’ of technological change—how technological revolutions leave behind workers not able to adapt—but miss the key point that skills have always been an endogenous function of investment. The real problem is the lack of public and private investments in R&D, human capital formation (skills and training), and fixed capital. As early as 1821, David Ricardo worried about the effect of mechanization on labor displacement. What was important then, and should inform our thinking now, was that profits (from mechanization) be reinvested into production, meaning that, in Ricardo’s time, while some jobs fell away, others were created. Our focus today should also be on that kind of reinvestment, which can also help to tackle inequality. This brings us to a key point: What economies need, today, is not only a new approach to investment, but also a New Deal in terms of reinvestment: a new compact between the public and private sectors that can lead to more inclusive growth. This should be part of a broader approach to market shaping to ensure social returns reflect the public investments that have been made including, for example, reforms to patenting (keeping them narrow and downstream) and conditions that profits generated from publicly supported innovation are reinvested back into innovation and not hoarded or used mainly for share buybacks. Indeed, it was precisely this type of healthy deal making that led to AT&T being asked to set up Bell Labs in exchange for its monopoly status. The Queen’s 2008 question touched a nerve. Eight years on, it is pertinent to ask what we have really learned, given the continuing problems of public and private investment. We should be willing to question core assumptions about how economies grow and what inhibits growth. It means understanding why inequality must become a central concern of economic policy, for economic reasons. It means re-evaluating the role of public and private actors in generating growth; what drives investment; and how far the direction of growth can be shaped to benefit society. It means rethinking the role of government, understanding how an entrepreneurial state can actively stimulate new private sector investment. It means bringing back the notion of public value to economics—beyond the narrow way that the public good has been used to create a small slice of activity for the public to invest in. It means, in short, rethinking capitalism.